During the Gallipoli Campaign, Australian and New Zealand troops left behind a powerful legacy commonly known as the Anzac legend. To this day, the Anzac legend and the Anzac spirit it embodies continue to shape our national identities. Anzac Day offers an opportunity for educators and students to revisit the Anzac legend and the indelible imprint it has left on the Australian psyche. Below are some resources and activities to help students develop deeper contextual and critical understanding of the subject. The following lesson plan is designed for high school students using resources from Britannica School and other online sources. Contact your library staff to find out if your institution already has access to Britannica School or claim your own free trial. ACDSEH097 The commemoration of World War I, including debates about the nature and significance of the Anzac legend. Investigating the ideals associated with the Anzac tradition and how and why World War I is commemorated within Australian society. ACDSEH108 Experiences of Australians during World War II (such as Prisoners of War (POWs), the Battle of Britain, Kokoda, the Fall of Singapore). Explaining the significance of Kokoda as the battle that halted the Japanese advance on Port Moresby and helped foster the Anzac legend. • Various work samples based on tasks completed e.g. biography or timeline. • Observation of group discussions. When Great Britain declared war on Germany in August 1914, the British Empire also entered World War I on the side of the Allies. Australia and New Zealand, which were dominions within the empire, each sent soldiers. Their troops were combined to form one corps - the Australian and New Zealand Army Corps, or ANZAC. The following resources and activity sets can be distributed as guided study resources or used to frame further group discussions. Originally coined as the convenient acronym of a military formation, the term "Anzac" is now a word with multiple uses and meanings, all deeply entrenched in the Australian cultural, political and social lexica. Charles Bean, an official Australian war correspondent and historian, is often credited with popularising the word through his published writings and work. Since 1921, the use of the word “Anzac” in Australia has been governed by federal legislation, under the Protection of Word “Anzac” Regulations. 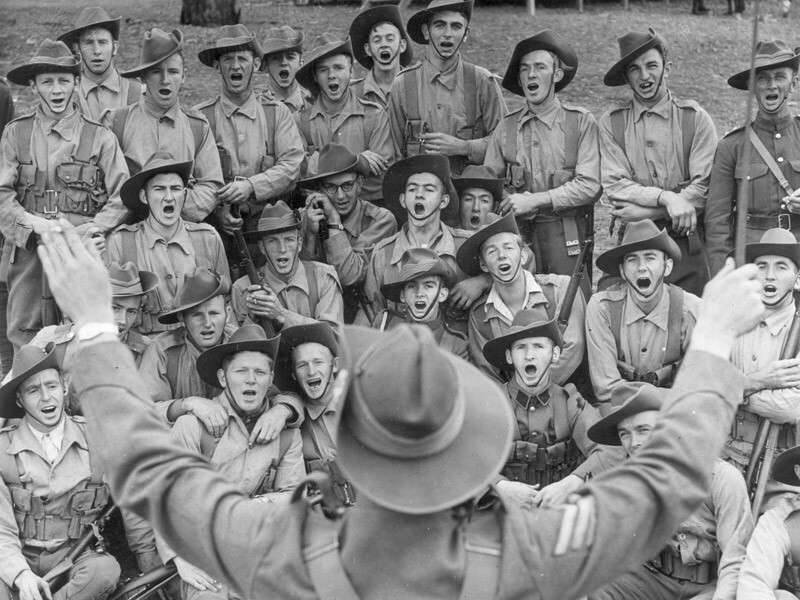 The "Anzac legend" is a term used by historians to refer to how Australians depicted themselves in war; how they thought, spoke and wrote of their wartime experiences. At times, these depictions might deviate from the actual experience. For this reason, some critics of the Anzac legend refer to it instead as the "Anzac myth". By dawn on December 20th Anzac had faded into a dim blue line lost amid other hills on the horizon as the ships took their human freight to Imbros, Lemnos and Egypt. But Anzac stood, and still stands, for reckless valour in a good cause, for enterprise, resourcefulness, fidelity, comradeship, and endurance that will never own defeat. - C. E. W. Bean, "Anzac to Amiens"
The above excerpt by Charles Bean is taken from his book "Anzac to Amiens" and describes the evacuation of Australian troops from the Anzac Cove area, Gallipoli Peninsula, in December 1915. Explain how the terms and descriptors used in this passage portray the Anzac legend. Using the information from the video and the images depicting the Anzac Spirit, create a presentation based on your understanding of the Anzac Legend, explaining Why I am proud to be Australian. The Anzac Spirit is an encompassing term for the positive characteristics exemplified by Australian and New Zealand soldiers during the war. These qualities are widely recognised to include courage, "mateship", good humour, ingenuity, an egalitarian respect for human life and tenacity in the face of extreme hardship. Examine the role and significance of John ‘Simpson’ Kirkpatrick in the creation of the Anzac legend. John Simpson Kirkpatrick is popularly known as ‘Simpson’ and is remembered by many people for being a kind and brave soldier. Using the source materials above, discuss the life of Simpson. Include information about his early life and previous experience working with donkeys. Explore his use of donkeys in transporting wounded soldiers from the battlefields of Gallipoli. Create a timeline illustrating the events of Simpson's life and eventual death during the Gallipoli Campaign. Simpson was one of many medics providing help to soldiers. Discuss why people might want to make Simpson a ‘hero', what makes someone a ‘hero’ and how stories about people can change over time.